Here are the mystery names which appear on items from Belle’s box. This list is of people for whom partial information can be found by studying the items from Belle’s Box. Keep in mind that not all 400+ items have been transcribed to date, and perhaps more information about the people on this list will be found. If the people are identified by later items, and if so I will add them to the “Cast of Characters” post, and delete them here. In the meantime, if you can identify these names associated with Belle (Lamunion) Fellows Tinker, Charlie Tinker, Wexford county or Newaygo county Michigan, please contact me. Agnes 2-28 Sent Mother’s Day card to Belle, no date. Ashley, Clinton L. “Mike” 2-73 V-mail, 30 November 1943. B, Jessie 34 Sent a card to Belle postmarked Manton, Mich, sometime after 15 July 1913. Sent a Christmas cards to Belle, in unknown years. Baldwin, Mrs. 54 Mentioned in a post card sent from Mrs. Culver to Belle in 1920, in connection with the ladies aid. Beardsley, Mr. & Mrs. 2-80 Undated Christmas card. Beardsley, ?? 47 Sent a card to Belle postmarked Sandusky, Mich., August 7, 1930. Blanche 11 Sent a postcard from Traverse City, Michigan to Dana Taylor of the Manton area. Bisard, Mrs. 11 Sent a postcard to Belle in 1910. 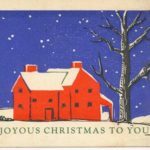 Borghild & George 11 Sent a Christmas card to Belle in 1928..
Colbert, Dr. & Mrs. 2-56 Sent a sympathy card, probably after Charlie’s death. Colbert, Eare & Marie 2-32 Christmas card, 1947. Colley, Maud 2-16 Birthday card, 1945. 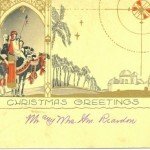 Colley, Maud 2-88 Undated Christmas card. 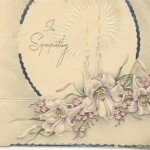 Colley, Maud 2-8 Sent a sympathy card to Belle. The card was signed,”Mrs. Maud Colley, Fred and Charles Warren”. De Baets, Mr. & Mrs. Emil 2-72 Sympathy card, probably after Charlie Tinker’s death. Decker, Beatrice 25 Sent an undated birthday card to Belle. Emma 64 Referred to in a postcard sent by Hattie to Belle in April, 1921. Edd 64 Referred to in a postcard sent by Hattie to Belle in April, 1921. Gardner, Bertie 2-71 Undated birthday card. Goodall, Patty 2-45 Undated Christmas Card. Gray, Harry 37 Recipient of a post card from “Ona” of Lincoln, Nebraska, mailed 10 Sept 1908. Hubbard, Ann 2-50 Undated Christmas card, maybe from the same person as item 43. Jacobs, Mr. & Mrs. C. 23 Birthday card to Belle, undated. Jacobs, LeRoy & Elizabeth 2-44 Undated expression of thanks. Mary & Millie 2-57 Undated Christmas Card. Minnie & Frank 2-20 Undated Christmas Card. NF 31 Sent a card to Charles Tinker on 15 October 1915 from somewhere in Michigan. Nutter, Walter 2-77 Undated Christmas Card. Potter, Mr. & Mrs. Perry E. 2-68 Undated sympathy card. Reed, Olia 29 Sent a card to Belle 9 Dec 1911 from Grand Rapids. Her address: 0176 Second Ave.
Reed, Olia 27 Sent a card to Belle, no date, her address: 721 Oakland Ave.
Reed, Olia 24 Sent undated card to Belle, possibly with forwarded mail. Reed, Olia 106 Sent card to Belle from Grand Rapids, March 4, 1913. Rice, Mrs. Nora of Nashville, MI 2-79 Undated Christmas Card. Skidmore, family 2-12 Undated Christmas Card. Skidmore, family 2-96 Undated Christmas Card. Vern, Julia & Juanita 2-57 Undated Christmas Card. 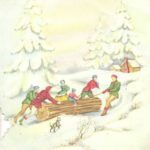 Warren, Fred and Charles 2-8 Sent a sympathy card to Belle. The card was signed, “Mrs. Maud Colley, Fred and Charles Warren”.